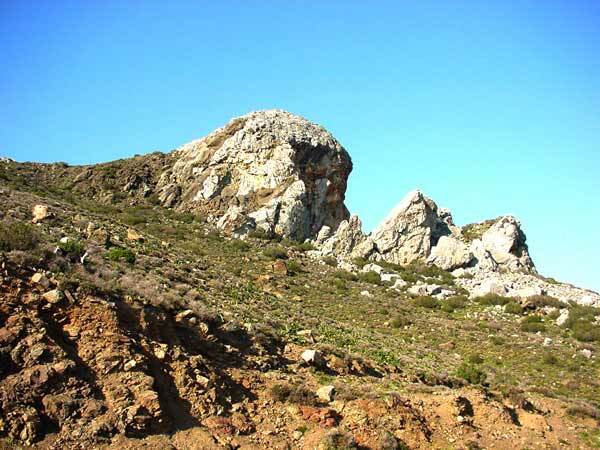 The Thermes are about 12 km south of Kos Town on the southeast tip of the island. 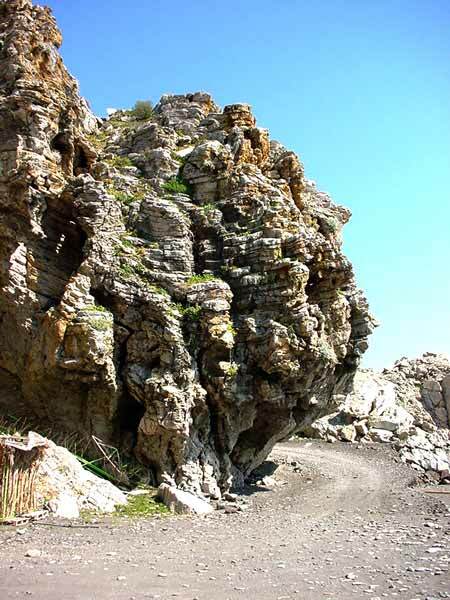 The Thermes near Agios Fokas with beach are easy to reach with a good road all the way. 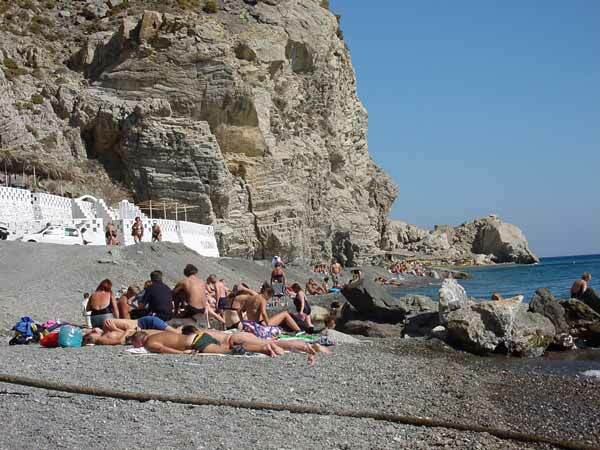 The road climbs from Agios Fokas and Thermes lies beyond Agios Fokas cape where the hot springs are well signposted and there is parking for ± 50 cars. There are regular buses (on the schedule with *) that drop off at the Thermes and it's not too far to cycle as there are no big hills. There are kiosks by the car park before a dirt track road drops down to the beach. It's only a five minute walk but it's fairly steep and dusty, as you will find when you come back up. It is possible to get a car down but there is nowhere to park or turn so it's better to walk. 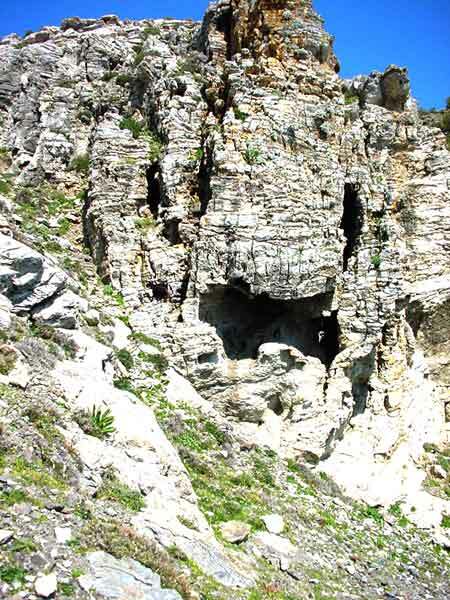 Dark cliffs loom up on either side, some with large cracks and fissures. 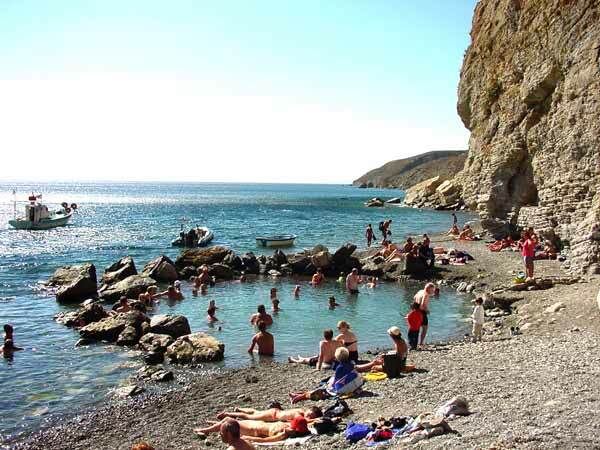 Hot water springs from a rocky pool and out to sea through large boulders. The hot water pool is big enough for 60 or so swimmers and deep enough at the far side to swim, though it's often so crowded there is hardly room. Sea waves crash in over the boulders to keep the temperature down. It is not wise to stand near the water source where hot water comes out as it can get very hot (42° C). The sulphurous smell can be pretty overpowering at first but you quickly get used to it. The hot water from the source and cold water from the sea can make the experience both weird and invigorating. 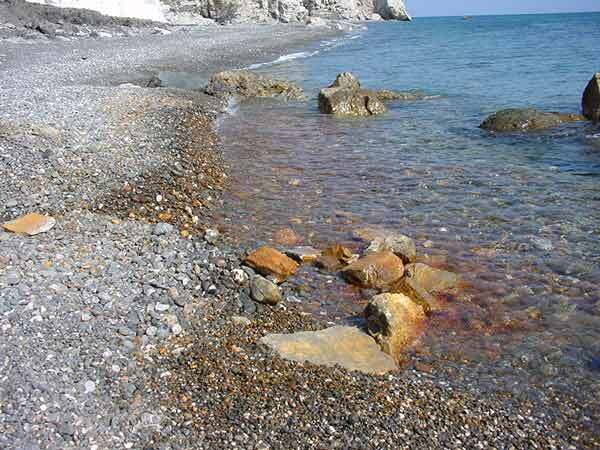 The beach itself is a very scruffy sweep of black shingle and those not wearing suitable footwear will find standing out to sea even more uncomfortable as some of the underwater rocks and stones are very sharp indeed. Many find the kiosks a relief after climbing back up the steep hill and visitors report reasonably priced snacks and very friendly and helpful staff. Although entry to Thermes is free. Click to display bigger picture!